Natural Gas Processing Plants are using Tunable Diode Laser Analyzers for fast, accurate, cost-effective H2O measurement. SpectraSensors tunable diode laser moisture analyzer in gas processing facilities. 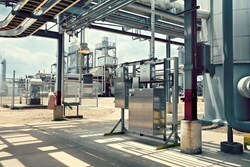 SpectraSensors, Inc., of Houston, Texas is now installing its tunable diode laser moisture analyzers in gas processing facilities to help improve processors natural gas measurement techniques in molecular sieve dehydration beds. “Cryogenic plants are allergic to moisture, we have to keep it out at all cost,” says Charles Bates, who was the plant supervisor at Okarche, Oklahoma facility for DCP Midstream. “When moisture is not managed properly it causes loss of efficiency and earnings.” Proper operation of the molecular sieve dehydration system is therefore critical to the operation of any natural gas processing or LNG plant. In theory it all works fine. But the whole process of natural gas sampling hinges on one key element…the analyzer that tests the desiccant dryer outlet gas for moisture content. If a bad measurement is made here, it can become a major economic blow or even shut the plant down. And there are lots of ways to make poor operational choices with bad information. All of these drawbacks have led many plant managers to turn to TDL moisture analyzers as the answer for fast, accurate readings with virtually no maintenance costs. SpectraSensors, based in Houston, Texas, is the world’s leading provider of extractive TDL analyzers with over 90% of the installed units. SpectraSensors became the first company to develop and manufacture online TDL analyzers based on that technology for use in hydrocarbon streams. Since a laser beam is used, there is no physical contact between the gas stream and the sensor. The result is fast, accurate measurement of natural gas sampling from an analyzer that is nearly maintenance-free for many years of operation. There is a built-in verification system that emits an accurate level of moisture for field validation purposes. Coupled with a high efficiency dryer, this validation system solves the long-standing problem of a lack of accurate field references for trace moisture analyzers. “I’ve tried a lot of moisture analyzers over the years, but they never gave me the accuracy or response I had to have. With the SpectraSensors TDL all those problems go away,” adds Bates. One of the first cost savings realized in natural gas measurement at the processing plant involves desiccant drying regeneration. Since the TDL H2O moisture analyzer provides near-instant and accurate information, plants have been able to extend time between regenerations by up to 20%. Fewer regeneration cycles means less thermal cycling, less thermal damage to the sieve, and longer sieve life. If a plant can eliminate even one extra recharge in ten years the savings could add up to $100K in sieve replacement costs. And since the entire system is down for two days during each reload, the cost for that reload could reach $400K in lost revenue at today’s gas prices. For larger processing plants, it could even be much greater. There is also the added expense of loading contractors. Because of the physical property changes that are required for other technologies to do their measurements, “electrochemical” sensors can take up to an hour or more to report changes in the moisture level. Instead, TDL analyzers measure the absorption of light. TDL analyzers report a fresh reading every 16 seconds. A TDL analyzer also has the advantage of reducing the potential for measurement interference. Because there is no contact with the gas there is nothing to get saturated and fowled as happens with traditional electrochemical sensors. This also means with TDL measurement there is very little scheduled maintenance. If there are other types of chemicals present in the process (especially methanol or glycol) traditional measurement techniques can mistakenly read these as moisture, and might prompt unnecessary process changes or shut in. Quartz crystal analyzers are particularly susceptible to this. TDL also comes with superior sensitivity and the ability to measure moisture in the parts per billion (ppb) levels accurately. For natural gas measurement in processing plants, TDL analyzers are offering a host of advantages including new advancements in speed, accuracy, and reliability. For more information contact: SpectraSensors, Inc. 4333 W Sam Houston Parkway N, Suite 100, Houston, Texas 77043; Phone 713-466-3172; FAX 713-856-6623; or visit the web site: http://www.spectrasensors.com.